Morena Baccarin Pregnant With Ben McKenzie’s Baby: Gotham Stars Having First Child Together, Already In Second Trimester! Morena Baccarin is pregnant with Ben McKenzie’s baby! 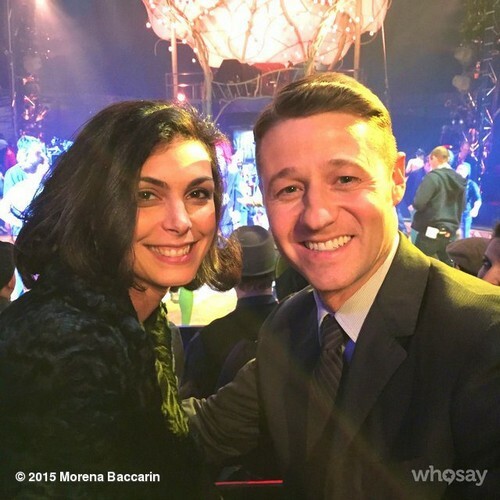 Morena and Ben met while filming Season 1 of Gotham. Morena’s character Leslie Thompkins actually played the love interest of Ben McKenzie’s character James Gordon. Baccarin and McKenzie walked the red carpet together during the 2015 Emmy Awards, and rumors erupted that the Gotham co-stars were dating, although neither of them confirmed nor denied it. Now, less than a week later we can confirm that not only are Morena and Ben dating, but she is pregnant and they have a baby on the way! Baccarin isn’t just a little bit pregnant either, she is actually already in her second trimester. Here’s where it gets interesting. Morena is actually still in the process of divorcing her first husband Austin Chick – and they are currently battling over custody of their 1 year old son Julius. According to TMZ, Morena Baccarin filed papers in court on Thursday September 24 asking for changes in the custody agreement over Julius, because she is pregnant and soon she will not be able to fly back and forth to pick him up from Los Angeles and take him to her house in New York. So there is no doubt that the Gotham actress is indeed pregnant. This will be Ben McKenzie’s first child, and her second. Despite the fact that the court documents are public information, neither Ben nor Morena are speaking out about their relationship or the exciting baby news. However, TMZ’s inside sources are reporting that the Gotham stars are thrilled to be expecting a child together. Now, let the speculation begin. Does this mean that Leslie Thompkins and James Gordon will be having a baby together on the FOX drama? Will they write the bump in to the story? Let us know what you think in the comments below! Gotham’s Ben McKenzie and Morena Baccarin Dating, Romance Between James Gordon and Leslie Thompson is REAL! Kandi Burruss Pregnant With Todd Tucker’s Baby After IVF: Mama Joyce Not Happy? Ice-T Asks Coco For DNA Test After Cheating Scandal: Is Coco Pregnant With Ice-T’s Baby? Candice Accola Pregnant With First Child – Will The Vampire Diaries Caroline Have a Baby Bump Too? ‘Southern Charm’ Kathryn Dennis Pregnant: Expecting Baby #2 with Thomas Ravenel – Wedding In Their Future? Joseline Hernandez Pregnant With Stevie J’s Baby: Love & Hip Hop Stars Faking Pregnancy To Promote New Reality TV Show?